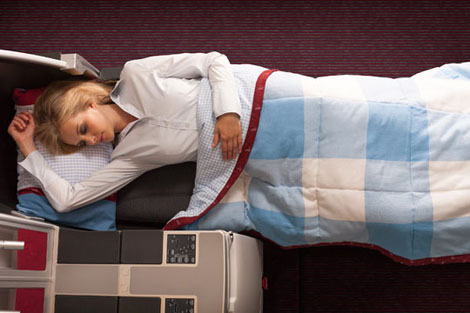 Austrian Airlines has begun a refit of its entire long-haul fleet, including the installation of fully-flat business class seats in a staggered formation, similar to those seen on Swiss and Finnair (see online news December 22, 2009). 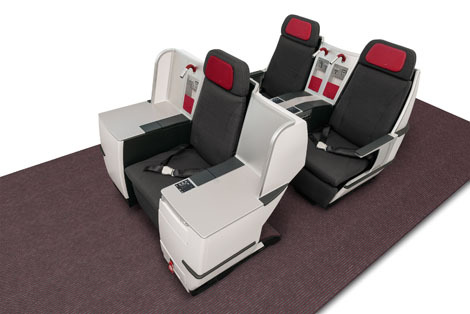 The business class layout allows four in five passengers to have direct aisle access on the carrier’s B777s, in a 1-2-1/2-2-2 configuration and aisle access for all passengers on the B767s in a 1-2-1 layout. In economy class the layout remains 3-4-3 on the B777 and 2-3-2 on the B767. 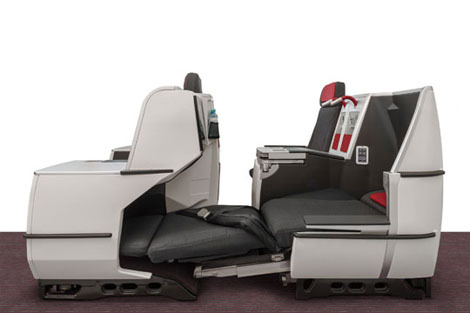 The seat reclines in to a fully-flat bed of just under two metres long with retractable armrests which allow the seat width to be increased from 20 to 24 inches. The inflation of the seat cushions can be altered by a set of controls, allowing for a harder or softer bed, depending on preference. There are universal power sockets and USB connectivity in all business class seats. A new look economy cabin will also be installed, with a seat pitch of 31 inches and the RAVE touch-screen AVOD in-flight entertainment system by IMS will be available in both classes. Screens in business are 15 inches and nine inches in economy. The conversion of each long-haul aircraft will take around six weeks. The first converted aircraft should take off before the end of this year and conversion of the entire fleet is due to be complete by spring 2013. Austrian has invested €90m on its new long-haul products and this follows an upgrade to its short-haul product which was completed last year (see online news September 7, 2011). For more information visit austrian.com.